The Emergency Shutdown System (ESD) is designed to protect the personnel, plant, equipment and the environment against pollution. 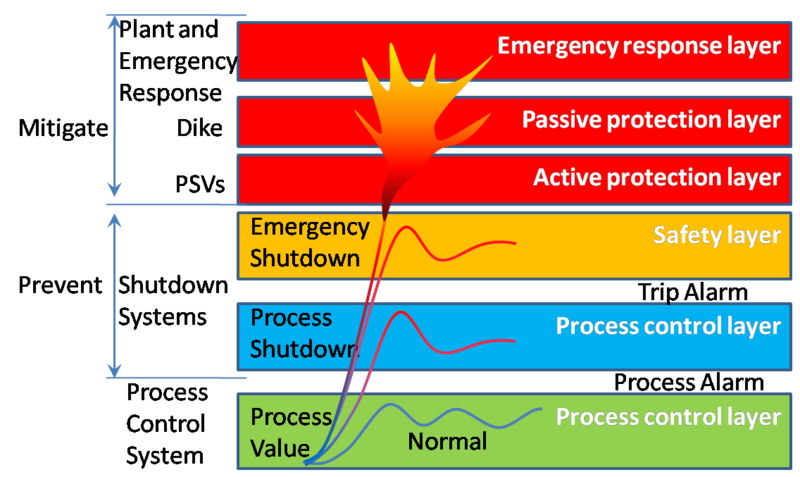 The purpose of the ESD system is to monitor process safety parameters and activate or shutdown the process system and/or the utilities if these parameters deviate from normal conditions. Fig : Safety Layer Protection. The ESD system operates in a fail safe mode, i.e. de-energized status of any digital sensor (input) or actuator (output), and fault detection of any critical system component and field inputs/outputs shall result in an action that will bring the plant to the safe condition (energised in normal condition). The control valve can be controlled by the PCS when the ESD logic is reset. Further to a shutdown, the related ESD levels need to be individually and manually reset by the Operation Console operator. The ESD level can be reset only if the upper ESD level is in normal condition. Unless otherwise specified, SDVs/BDVs valves (shutdown or Blowdown) are locally manually reset. Local permissive resets are input to the ESD system. In order to be able to start-up equipment or sections process, it is necessary to inhibit some inputs to the ESD system, as sensor signal may be in abnormal state prior to start-up and could cause a shutdown. Such inhibits are designated as “start-up inhibits”. Each inhibit function is reset automatically either by the sensor signal reverting to normal state or after a predetermined time delay. The automatic resets are achieved by the Safety Shutdown System. Start up / maintenance inhibits are set manually by the operator from the Operation Console through a touch-target on process control displays which appear only when the signal to be inhibited is in alarm and not in technical fault. Start –up / Maintenance inhibit statuses are indicated on the process control displays and ESD displays of the Operation Console and printed on the events printer.